New range under construction: War of the Spanish Succession. First pack will be available on pre-sale, all sales will be shipped next Monday, the 23rd of April. This range was originally planned for the second half of this year but I did have them on preview at "Tactica" in Hamburg. Wargames Illustrated, also present at "Tactica" came by our stand for some pictures and this way the news got out a bit sooner then expected. I've had a lot questions about when they will be available. First I don't want to alarm our ancient and WWI customers that might think these ranges will see no new items this year, don't worry, a lot of new ancients and WWI packs will appear this year. In fact our WWI German machine guns are just waiting for the production moulds to be released. And secondly since the first pack of WSS figures is ready, they are available for those of you who want to see our miniatures and to have a feel of what this range will be about. The pack contains 4x7 miniatures in march attack and two different sergeants. Some information on the approach of this range. 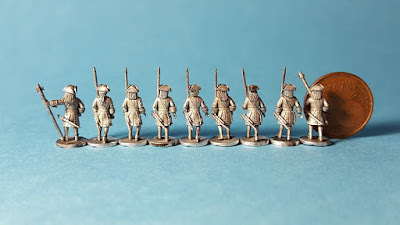 Since the uniforms for this time period are so beautiful I really wanted to make miniatures that stood out accordingly. To increase their overall appeal and to make them look more dynamic I made seven figures in march attack, all with different heads, hair and slightly different poses. 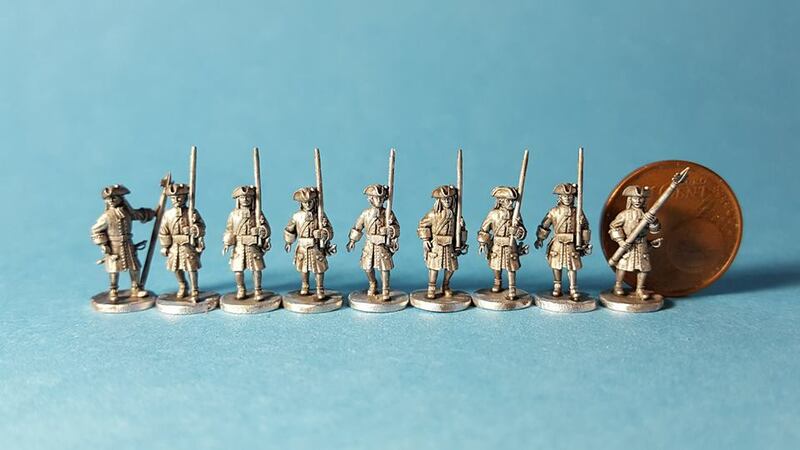 These seven different figures will serve as a basis for the other infantry troop types. For example, the first batch has a ventral ammunition pouch and can be used for French and Spanish infantry. The next will have their ammunition pouch on the right hip, grenadier versions will have different headgear, etc. This way I hope to cover most of the infantry uniforms in use during the war of the Spanish succession. Cavalry and artillery will be covered in the same way. After all the core elements are present we can look if there are any gaps in the range that need additional figures.